Resistance! was produced in 1980 by members of the Dublin Anarchist Group who also ran the ABC bookshop in Dublin’s Marlborough Street. This second issue was also the final one. 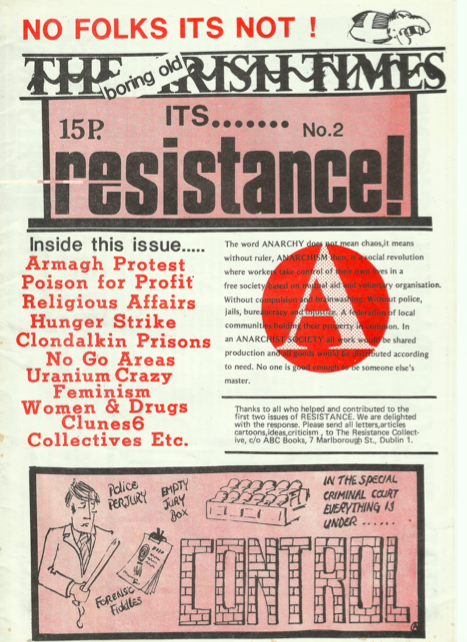 However a couple of members were involved in the formation of the Dublin Anarchist Collective in 1983, which also published a bulletin called Resistance. In the article on Armagh & H Block the difference between Sinn Fein and themselves is expressed as “We are Anarchists, not Republicans, the main difference being the latter’s Statist ambitions, in contrast to our Libertarian proposals”. There is no discussion of Sinn Fein’s ‘socialism’, nor of the historic anarchist position that the State only has a function when a minority class rules. A few pages on from this there is an advert for raffle tickets in aid of Sinn Fein. Other articles include uranium prospecting in Carlow, the proposed Wheatfield prison, an extract from Gaston Leval’s book about the collectives during the Spanish Civil War, and a long piece about the toxic pesticide 2.4.5-T which was widely used on farms. There is also a cartoon strip about the life of Ukrainian anarchist Nestor Makhno. Unfortunately pages 11 & 12 are damaged. Resistance! was produced in 1980 by members of the Dublin Anarchist Group who also ran the ABC bookshop in Dublin’s Marlborough Street. 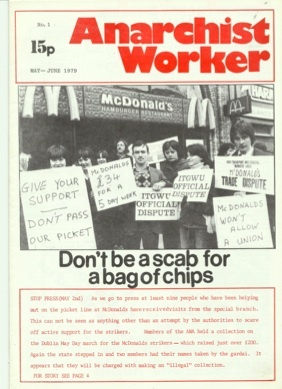 Much of the magazine is given to stories about “state repression” (H Block, Mountjoy jail, the Curragh military prison, Noel & Marie Murray, torture of criminal suspects in Sundrive Road garda station, and an uncritical short about an arson attack on a clothing factory which had a contract for Garda and Army uniforms – with no mention of the people put out of work). Circulation was about 500 copies. Other articles of note are one criticising the Sunday World columnist Fr Brian Darcy for “writing lies and misrepresentations” attributing industrial unrest to “sinister anarchist groups” like the Socialist Workers Party! ; and a review of “the right” which put Trotskyists and Fianna Fail on the same side of the left/right divide. Believing in the concept of creating alternative anarchist organisations (unions, campaign groups, etc.) rather than being active where people already are and trying to win them over, we see a call for a new ‘syndicalist’ union and the announcement of a ‘Student Anarchist Movement’. Nothing more was heard about either. In the anti-nuclear movement, for which the Contaminated Crow magazine in 1979 listed 46 local groups, they refused to engage with others and instead set up their own Anti-Nuclear Collective. They were also sympathetic to “armed struggle” but there is no suggestion that they actually practiced it. 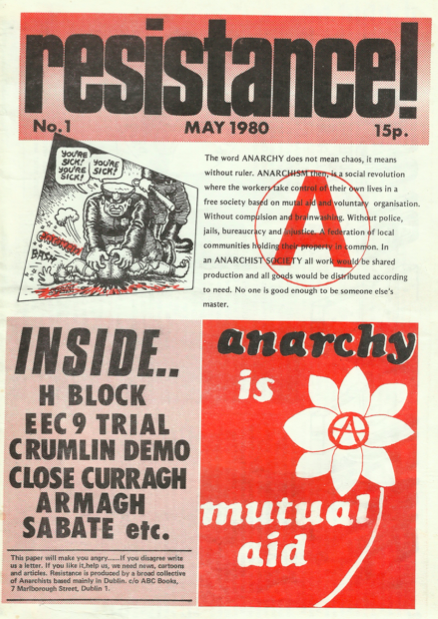 Only two issues of this magazine were published and the group disappeared shortly afterwards, though a couple of members were involved in the formation of the Dublin Anarchist Collective in 1983. Among those involved were ex-Provos like Billy Jackson and Jackie Crawford, as well as Mike Gilliland (whose father was a former President of the Methodist Church), Doreen McGouran, Steve Woods, Denise Jackson.